Funny Bird Moments ~ The Sequel! In my blog entitled Funny Moments – This is for the birds, I shared with you some photos of beautiful birds caught in awkward moments. I post some of these humorous pictures along with captions on Facebook hoping to make someone smile. I enjoyed putting them all together last time in blog form, so I thought I’d produce the sequel. Some of these awkward, funny and human-like moments many of us can relate to! El Cormoranto singing O Sole Mio! The politician on the Stump! I was on a mission one morning looking for a Great Blue Heron known by the locals as Big Blue, who usually owns the pond that El Cormoranto had taken over, but he was nowhere to be seen. As I was walking around a bend heading back to my car, I spotted him out of the corner of my eye. There he was in a small swampy area, in the rain, all by himself, looking down and out. The Cormorant had taken over his territory and he looked terribly misplaced. 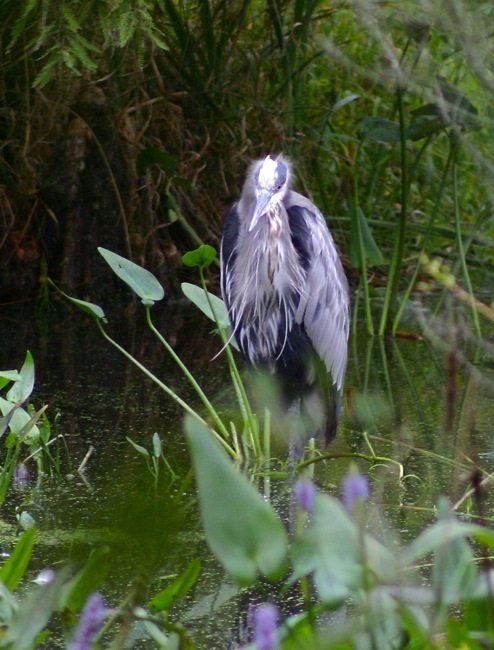 Living out in the rain in the swamps is hard on this old bird's feathers! On an afternoon ferry ride across the James River headed to Smithfield, VA, I took this shot of some seagulls. 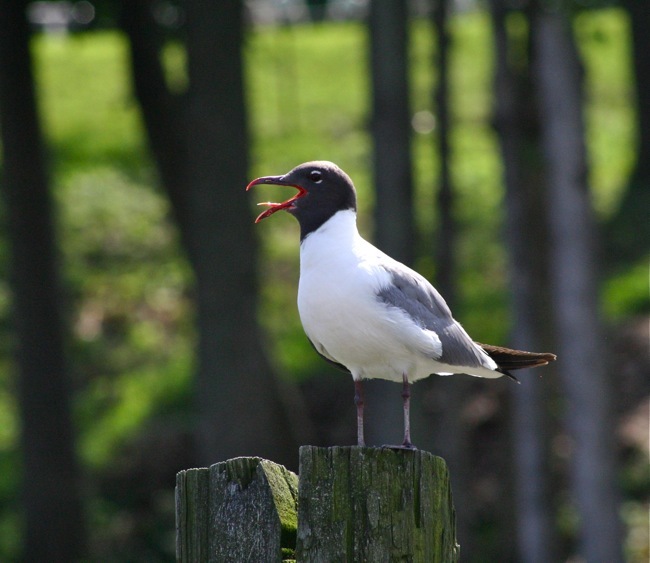 One gull seemed to be taking over as the tourist guide for the group and was informing the group that they had a long flight ahead of them! It's going to be a long flight, so if anyone has to go I suggest you go now! On another outing we were walking down a dock and we had the feeling that someone was looking at us. 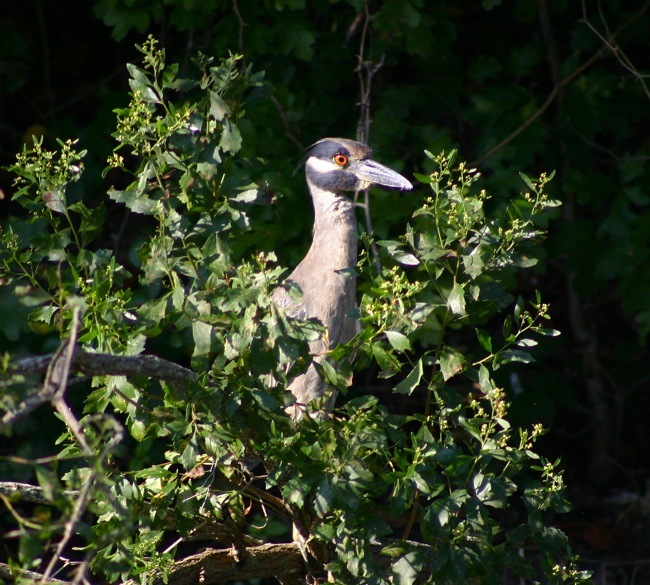 The sun was shining on this Yellow-Crowned Night Heron who was popping right out of a bush, frozen still as if he was trying to blend into the scenery and go undetected. A bird in the bush is better than none in the bush! If I stand really still I don’t think anyone can see me! This juvenile Yellow-Crowned Night Heron appears almost naked and cold with his new feathers. I think he was embarrassed to be spotted and photographed. Has anybody seen my feathers? Did you see Miley on the VMA Music awards show? Finally, this Tri-colored Heron perked up and is ready for take-off in this picture. Like a racer or swimmer on his mark, this bird is getting a slight head start by stretching over the starting line! I think he’s going to win by a neck! Trying to analyze the actions of these birds can lead one to wonder just what are they thinking? Sometimes, projecting human behavior on them provides some comedy relief. I hope you enjoyed seeing some of the more unusual photos I’ve taken. To view my bird paintings click here. My future birdlife paintings will show the birds in a more flattering light. Thanks for following my art, even though I have gone to the birds!! !